Back in November I told you we were dangerously close to getting an official LEGO set based on the adventures of everyone's favorite Time Lord. Today LEGO Ideas made it official—we're getting an official Doctor Who set, courtesy of Andy Clark of Firaxis Games. LEGO's Ideas program is a place for builders to submit their concepts for official LEGO sets. Once submitted to the site, a project must gain 10,000 votes to be considered by the LEGO review board as a potential product. Fans around the world have been voting the hell out of Clark's Doctor Who concept on the LEGO Ideas page since the senior artist for Firaxis posted it in February of last year. 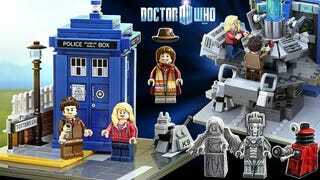 It was one of two Doctor Who sets in the running during the first 2014 LEGO Ideas review, but while LEGO approved a Big Bang Theory and a birds set from the group, the Doctor Who concepts were left up in the air. No longer, as LEGO announced today that Doctor Who and Companions will be making its way to store shelves later this year. No word yet on the composition and cast of the set—Clark gave the LEGO board several Doctors to choose from—but we'll almost definitely get an official LEGO TARDIS out of the deal, so everybody wins. Along with a Doctor Who set from a gaming professional, LEGO Ideas also approved a WALL-E set created by one Angus MacLane while working for Pixar on that very film. Check out the video below for a look at the decision process and a tingle of excitement as LEGO Doctor Who becomes a real thing.